Taylin’s long journey has brought her many blessings: has new friends, a new family, and even a peace of sorts with Ru Brakar, the evil mage accidentally bound into her service. She also has a new name: Pele, and a past she isn’t certain she wants to remember. All of her joy, however, has been threatened at every turn by the demon Immurai the Masked and his quest for something called the Soul Battery. Now, the truth about the Soul Battery and why Immurai wants it have been revealed and the only hope of saving Taylin’s adoptive nephew is bringing it and the awesome power it promises to the demon’s own doorstep. Faced with an island fortress protected by an army, not to mention the demon himself, Pele and her companions will need to tap every resource they can for even a hope of victory. One mistake might damn the world to Immurai’s rule and cost Pele everything she’s gained. 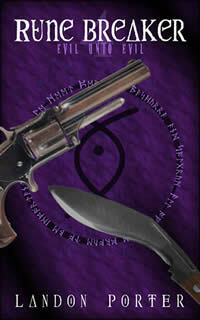 Collects Book 4, the finale of the web serial novel, Rune Breaker.